If selected, this option causes AB Commander to create another instance of it, with a separate window (independent on the already running one). 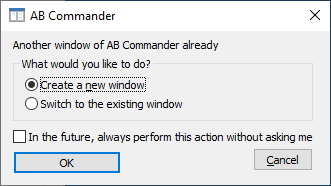 If selected, this option causes AB Commander to switch to the window that already exists, instead of creating a new window. If checked, this option causes AB Commander to always display the specified folders in its panels when starting. If this option is cleared, then AB Commander displays the folders that were displayed when it was closed. Note that you can also specify the startup folders via the command line switches of AB Commander. If checked, this option causes AB Commander to display it window as specified. If this option is cleared, then AB Commander displays its window as it was when it AB Commander was closed. Note that you can also specify the startup window display via the command line switches of AB Commander. 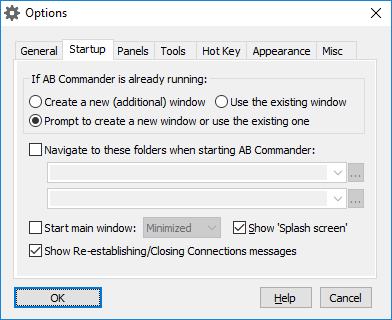 If checked, this option causes AB Commander to display its splash screen during startup. If this option is cleared, the splash screen is not shown at startup. When AB Commander is running, you can display the splash screen by pressing the Ctrl key and choosing the Help - About command from the menu, while keeping the Ctrl key depressed. To dismiss the splash screen, simply click on it with the mouse. This option controls the messages that AB Commander displays when it starts while trying to re-establish connections to slow folders (such as network drives or shares) and the connections take longer than usual. Or, when AB Commander is shutting down and closing connections to the slow folders. Such messages provide visual feedback about the activity. If you would rather not see such messages, clear this option.